A full service law firm committed to quality representation while maintaining a cost-effective approach to litigation without compromising our clients' particular needs. Geri Anne L. Hayes, Esq. Geri Anne L. Hayes, Esq. recently joined our firm in 2019. She attended St. John's University obtaining a Bachelor of Science Degree in Legal Studies in 2014. Ms. Hayes then went on to Maurice A. Deane School of Law at Hofstra University. 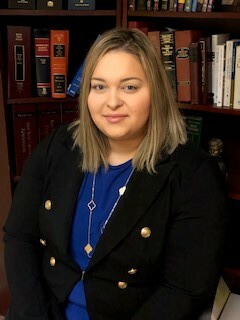 There, she commenced her legal career in 2016 as a student attorney assisting with unique cases surrounding the aftermath of Tropical Storm Lee, Hurricane Irene and Super Storm Sandy before various administrative agencies, such as FEMA, with the Disaster Recovery Clinic at Hofstra Law School. While at Hofstra Law School, she also participated in the Veterans Law Clinic assisting veterans with various legal issues at a bi-annual legal clinic and served as a member of the ACTEC (American College of Trust and Estate Counsel) Law Journal. She completed her Juris Doctor in 2017. Ms. Hayes comes to Desena & Sweeney from an insurance defense firm defending personal injury cases from their inception to trial or other method of solution, including arbitration. Currently, Ms. Hayes handles a wide range of negligence claims including personal injury, premises liability, motor vehicle, slip and fall and litigation matters. Building upon her knowledge of tort matters, Ms. Hayes seeks to continue her litigation practice and explore new areas of law.